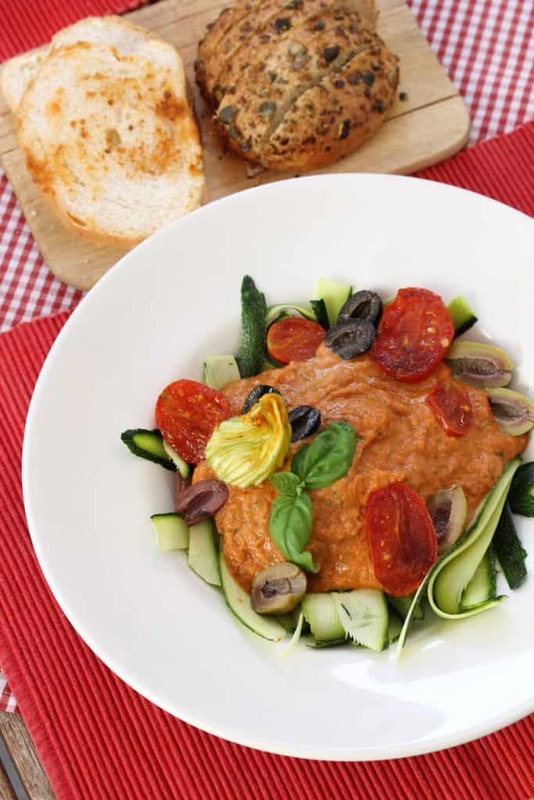 Creamy Grilled Red Pepper & Pilatitomatoe Sauce Zoodles – Mediterranean Summer Dish. It was again time to cook something that suited the burning hot weather. Bavaria is a dream, especially when the sun comes out. The sleepy villages, farms, families, and gardens are creating such a romantic atmosphere and really made me feel home, regardless of any prejudices. Today we made a tour with the bikes and drove from one garden to another and collected all the fresh vegetables we could carry in our bags. We carried the freshest tomatoes, cucumbers, arugula, and raspberries home. It was still boiling hot, so we decided to cook something refreshing. This dish really brought out how much different legumes can taste when they are fresh and local and not produced on a big scale. The zucchini was almost sweet and smooth as well as the super fleshy tomatoes which smelled amazing too. Start with heating some olive oil in two pans. Wash your tomatoes and the pepper. Cut the pepper into cubes and the tomatoes in half. Mince an onion and fry it in one of your pans until they get soft and slighty golden brown. Add the Pepper to the other pan and fry it until the whole pepper gets soft. Its not bad when the pepper gets dark on one or two spots, that just adds flavour as well. Add the finsihed onions and pepper to a blender and add some olive oil to one of the pans again to cook the tomatoes. Add some salt to them and let them simmer until they get soft and the juice comes out and starts to thicken. Thats when the flavour develops. Add the Tomatoes together with the Black Pepper, Basil, Rosemary , soaked cashews & nutritional yeast (vegan) or feta cheese and Salt to the blender. Blend the sauce until everything is well combined. If you want to garnish your dish with some roasted tomatoes start to use the rest of the heat from the stove to fry 4 in the used pan with the cutted surface facing downwards. take a shaver and shave the zucchini, or if oyu have a zoodle machine use it. Place the zucchini stripes to your plates and add the sauce to it. Fresh vegetables from the garden make a huge different in taste, smell and environmental footprint. Enjoy your day ! & soak in the sun !